It is essential that anyone planning on heading to the slopes in the coming weeks wears the right eyewear to safeguard their vision, it has been advised. Dharmesh Patel, chairman of the Eyecare Trust, said that if anyone is heading for the ski slopes this year they should not forget to pack their UV protective eyewear. As high altitudes increase UV radiation levels and fresh snow can reflect as much as 80 per cent of the radiation, it is vital that you protect your eyes both when you"re on the slopes and whilst enjoying the apres ski. 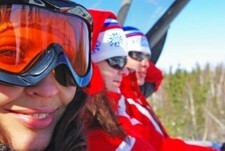 "Your sunglasses and ski goggles should block out at least 99 per cent of UVA and UVB light. Look out for the CE Mark or British Standard BS EN 1836:2005 to ensure they provide adequate protection," he advised. Some contact lenses also offer UV protection and could be an option for those looking to double-up with their vision precautions. Mr Patel explained that sunglasses are either variable tints, such as transitions, or marked with a filter category number from zero to four, where four is the darkest lens. Category four is suitable for exceptionally sunny conditions such as skiing, but people should beware, as they are illegal for driving in because they do not allow sufficient light transmission through the lens, the expert pointed out. He added that, as long as people take the time to purchase vision safeguards before travelling, they should enjoy their time on the slopes.